Copyright Dr Sarah J. Buckley 2005, 2016 This article may not be reposted or reproduced in any way without specific permission from the author. Contact Dr Sarah Buckley here. First published in Living Now, Winter 2002, supplement Women Now and reprinted in Living Now in May 2009. 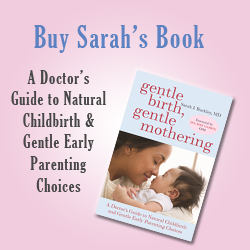 An updated version is published in Gentle Birth, Gentle Mothering: A Doctor’s Guide to Natural Childbirth and Gentle Early Parenting Choices (Sarah J Buckley, Celestial Arts, 2009). Oxytocin, the hormone of love, builds up during labour reaching peak levels at the moment of birth and creating loving, connected feelings between mother and baby. Endorphins, hormones of pleasure and transcendence, also peak at birth, as well as the fight-or-flight hormones adrenaline and noradrenaline (epinephrine and norepinephrine). These fight-or-flight hormones protect the baby from lack of oxygen in the final stages of birth and ensure that mother and baby are both wide-eyed and excited at first contact. Prolactin, the mothering hormone, helps us to surrender to our babies, giving us the most tender of maternal feelings as our reward. But these passionate hormones are not just feel-good add-ons. They actually orchestrate the physical processes of birth (and sexual activity) and enhance safety, ease, and pleasure for both mother and baby. This hormonal cocktail also rewards birthing mothers with the experience of ecstasy and fulfilment, making us want to give birth again and again. All mammals share virtually the same hormonal crescendo at birth, and this is a necessary pre-requisite for mothering in other mammalian species, switching on instinctive maternal behaviour. Birthing passionately does not necessarily mean birthing painlessly (although this may happen for some women). Giving birth is a huge event, emotionally and physically, and will make demands on the body equivalent to, for example, running a marathon. But when a woman feels confident in her body, well supported, and able to express herself without inhibition, the pain that she may feel can become bearable, and just one part of the process. She can then respond instinctively with her own resources, including her most basic and accessible tools: breath, sound, and movement. The problem in our times is that the passion of birth is neither recognised nor accommodated. Birth has become a dispassionate medical event, usually occurring in a setting that discourages emotional expression. If we are to reclaim our birthing passion, we must give ourselves permission to birth passionately and we must choose our birth setting and birth attendants with this in mind. It is likely that birth in these circumstances will be easier, helping us to step into new motherhood gently and gracefully. Passion is, to my mind, an opposite and an antidote for despair and depression. This is clear physiologically and hormonally. If we give birth, and are born, in passion, how different would our primal emotional imprint be? And what about our baby’s brain chemistry, which is being set even as we are born? Some studies have linked exposure to drugs and procedures at birth with an increased risk of drug addiction, suicide and anti-social behaviour in later life, and other commentators have suggested that contemporary problems such as learning disorders and ADHD may also be linked to drugs and interventions at birth. For example a labouring woman’s production of oxytocin is reduced by the use of epidural pain relief — this is the reason why epidurals prolong labour. And even when an epidural has worn off her oxytocin peak, which causes the powerful final contractions that are designed to birth her baby quickly and easily, will still be significantly lessened and she is more likely to have require assistance to birth her baby with forceps or vacuum as a result. Not only is oxytocin reduced in the labouring woman’s body with epidurals, it is also reduced in her brain, according to current understandings. This means that women who birth with epidural analgesia are likely to miss the pleasure and reward peaks, from birth to postpartum, when maximum oxytocin activity stimulates brain dopamine pathways. This stimulation imprints pleasure and reward in relation to newborn contact and care, and will continue to motivate and reward new mothers for the dedicated care that human babies–and all mammalian newborns–require. Synthetic oxytocin (Syntocinon, Pitocin), which has been called the most abused drug in obstetrics, is also implicated. This drug is used for induction and for augmentation (or acceleration) of labour. Large numbers of women giving birth in developed countries receive large doses of this drug in labour for one of these reasons. For example, in Australia this figure approaches 50 percent, and most women also receive this as their baby is born as part of a package of measures to reduce bleeding (Postpartum hemorrhage, PPH). When a labouring woman has synthetic oxytocin administered by drip, for induction or augmentation, her body’s oxytocin receptors may lose their sensitivity and ability to respond to this hormone. We know that women in this situation are vulnerable to haemorrhage after birth, and even more synthetic oxytocin becomes necessary to counter that risk. We do not know, however, what the long-tern consequences of such interference with the oxytocin system may be for mothers and babies. Surrender is not a popular virtue. In fact, surrender is often seen as a weakness in our culture, where we are instead encouraged to be active and in control of our lives. This “yang”, masculine attitude may serve us in some circumstances but we cannot birth our babies through sheer force of will. We need to learn the more subtle — yet equally powerful — path of surrender. For modern women, difficulty with surrender may reflect a lack of confidence in our bodies. This is not surprising when our society is distrustful of the natural order in general, and women’s bodies in particular. This view is further reinforced by the obstetric model, with its long lists of all that can possibly go wrong with our birthing bodies, and its myriad of technological fixes, designed to rescue us from these dangers. As midwife and author, the late Jeannine Parvati Baker reminds us, giving birth is women’s spiritual practice, requiring “…purity in strength, flexibility, health, concentration, surrender and faith.”2 It has also been said that to be consciously present at birth is equivalent to seven years of meditation. When we birth consciously, putting our great rational mind on hold, and allowing our instinctive nature to dominate, we can access the wisdom that all spiritual traditions teach: that the ego is our servant, not our mistress, and that our path to ecstasy and enlightenment involves surrendering our egoic notions of control. This level of surrender will also serve us well through our many years of motherhood. When we surrender conscious control, we also allow our deeper innate rhythms to surface: this can be a profound experience for a birthing woman. In allowing her labour to go at its own pace, without hurry or interference, a woman learns to trust her own, and her baby’s, natural rhythms. Such trust is another gift; another way that Mother Nature assists us to mother with ease and pleasure. In surrendering to birth, we learn to be truly present to what is, and we can discover more about our role on the Earth. We are not the rulers or architects of creation. Life comes through us, with the most ease and grace, when we simply allow it. It is easy to say that our problems in birth stem from the excessive power of the medical system and its agents, and a lack of power for the birthing woman. However a deeper analysis is necessary, I believe, because the time has come to dispel this idea of a power imbalance and to assert our innate feminine authority in birthing. Along with technology, we also prize information. In pregnancy and birth, becoming informed is equated with being responsible, both of which are strongly encouraged culturally; yet there is also a price to pay. We may have all of the information in the world, but we cannot predict our experiences in birth. And we can diminish our own authority in birthing and in mothering — we disempower ourselves — when we put more faith in information from the outside (tests, scans, others’ opinions) than our own internal knowing of our bodies and our babies. The truth is that our babies are constantly informing us of their needs and desires, and how we can best care for them. This is a physiological reality — the baby’s placenta is in constant communication with our bodies, transferring blood and nutrients and generating the placental hormones that organise our bodies and psyches for the optimal and specific mothering that this baby requires. In the same way, our cravings, yearnings, dreams, and inclinations in pregnancy can be communications from our babies, showing us the deeper ways of knowing that are richer and more true, even if less numerical or detailed, than information from the outside, such as medical tests. When we choose the traditional women’s path of inner connection, the path of our foremothers, we can both discover and reinforce an inalienable trust and power in ourselves and in our female bodies. This deep faith is the best preparation possible for birth and is also, to my mind, the basis of true responsibility; we are able to respond with our own truth. We can also use the medical system without giving away our power. Birth is dying, but, like cells in her body, we each have the power to enliven her and to resurrect her in all her glory. What is needed, I believe, is the passion, love, surrender, and power that we collectively generate as we birth our babies, however it unfolds. Thanks also, for inspiration and ideas, to Leilah McCracken and her trailblazing website (now deleted) www.birthlove.com, to freind and mentor Michel Odent and deep gratitude for the gifts of my own children’s births. This article also references my own research, presented in the chapter “Undisturbed Birth: Mother Nature’s Blueprint for Safety, Ease and Ecstasy” in my book, Gentle Birth, Gentle Mothering and all other references will be found in that article. For fuller scientific explanations and the most updated references, see my 2015 report Hormonal Physiology of Childbearing and related materials. 1. Baker JP. Hygieia College Mystery School. www.birthkeeper.com. 2. Baker JP. Prenatal Yoga and Natural Childbirth. 3rd ed. Berkeley CA: North Atlantic Books, 2001.